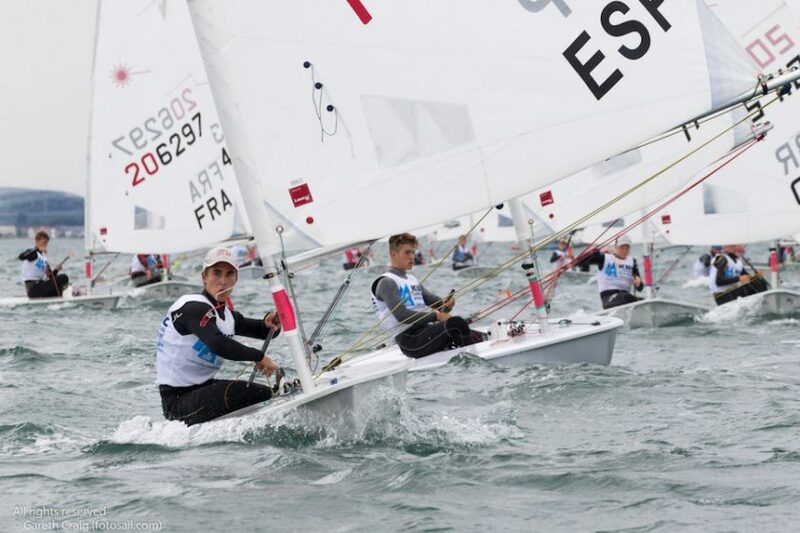 Fickle Winds Prevail at KBC Laser Radial Youth and Men’s World Championship. Catching up on the race programme is now the priority at the KBC Laser Radial Youth and Men’s World Championship after more races were lost to fickle winds on day two of the Dublin Bay championships on the Irish east coast today. Four races should have been completed in the 350–boat fleet at this stage but none of the boys four divisions, or the girls or men’s fleets have sailed the full programme. Of the two bay race courses operating, Course B’s three fleets have all sailed three races, but Course A has sailed two and the girls fleet has sailed only one. The boys fleet of 229 is by far the biggest and tomorrow (Wednesday) the race committee will ensure all four boys divisions have sailed the same number of races. ‘It may mean starting some fleets earlier”, warned Dublin race officer Con Murphy, who officiates at the Rio Olympics next month. Today’s races were sailed again in shifting westerlies gusting up to 13–knots but the mean strength was as low as six or seven, just above the minimum permitted for racing under regatta rules. It meant a long day on the water and back ashore there were some long faces at the Royal St. George Yacht Club inside Dun Laoghaire Harbour. ‘That’s about as tough as it gets’ said Australian champion, 17–year–old, Finnian Alexander who is counting a 2, 25 and 10 so far. ‘The breeze did 180 degree shifts and often the wind was 15 knots on one side of the course and five on the other’. Alexander, from Sydney’s Double Bay Sailing Club, said tactically he found it difficult to pick a side for the first windward leg and he said he was resigned to concentrating on just ‘scraping through’ the qualifying rounds that continue tomorrow. Both courses were set in the north west of the bay, where evidently the best of any pressure lay. At 3pm when both green and red fleets of the boys divisions were started the breeze was as high as 13–knots from 240 degrees but within an hour it was blowing from the opposite direction. For a time it looked like the young Australian’s red fleet would get a second race and a course was being set but Alexander confirmed ‘the race committee made the right call to cancel it’ when the breeze went east. Italy’s Ducchi Nicola, racing in the green fleet, was equally cautious about the prospect of steady winds this week. Nevertheless, the Lake Garda sailor has put together a consistent early series of a 4, 7 and ten. ‘I use my head in these difficult conditions. I make sure to look all over the course before I tack’, he says. Men’s fleet competitor Abdulla Janahi, the sole Bahranian sailor, was leading today’s single race but the wind shifted and he dropped to fourth. He says he lost two more places on a reaching leg and admits he lost two more on the line and finished ninth in his third race of the series to put him 13th overall. Despite being afloat for seven hours, the girls 76–boat fleet had no results after their race was abandoned. The hard working race committee did all in its power, including laying two alternate marks, to save the race from the vagaries of the wind but it was to no avail. Sailing instructions permit more than two races per day so it is likely organisers will move to sail multiple races tomorrow but this is subject to wind. Unfortunately, winds – again from the west – are currently forecast to be less than today.